This Thursday, March 24th, an exhibition will open in Rome, Italy, at the Museum of Contemporary Art. The curator, Gabriele Tinti will be featuring selected portraits from world renowned photographer Howard Schatz project: The Italian-Americans in Boxing. Star Boxing President and CEO, Joe DeGuardia will be in attendance as his portrait will be one of the pieces featured at the exhibition. Also in attendance with be the chairman of the FPI, Franco Falcinelli and the councilor for the sport of the City of Rome, Alessandro Cochi. DeGuardia arrived in Rome today and will spend the remainder of the week in Rome, taking part in the week's planned activities. "It is an honor to be featured in the exhibit in Rome and in Howard's project," said DeGuardia. "Howard, is one of the most prolific photographers in the entire world, and his work, especially with respect to the boxing world, is absolutely extraordinary. I can't wait to see how the entire exhibition actually all comes together." In 2010 Schatz was announced as the winner of the prestigious American Photo: Images of the Year award and the Priz de la Photographie Paris as Photographer of the Year. His photos have been published in the world's leading magazines, including Time, Sports Illustrated, ESPN Magazine, Vogue, Vogue Italia, GQ Italia, The New York Times Magazine, The New Yorker, Stern, Life, Black/White, and American Photo. Schatz has also worked with such companies as Ralph Lauren RLX, Escada, Sergio Tacchini, Nike, Rebok, Wolford, Etienne Aigner, Sony, Adidas, Finlandia Vodka, MGM Grand Hotel, Virgin Records and Mercedes-Benz. 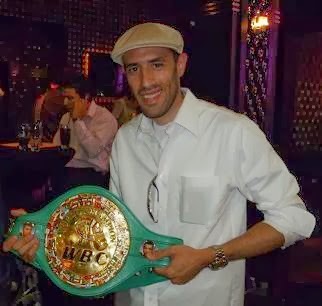 In addition to Schatz's exhibition; which will be attended by such Italian world champions as Gianfranco Rosi, Francesco Damiani, Nino Benvenuti , Sumbu Kalambay, Maurizio Stecca and Gianluca and Silvio Branco, and current boxers Vinny Maddalone, Domenico Spada, Daniele Petrucci, Andrea Di Luisa, and Manuel Ernesti amongst many others; a book, written by Gabriele Tinti, the curator of the exhibition about Italian-Americans in boxing, will also be presented. The book will be published by Allemandi and will include a short text by actor, Michael Imperioli. The exhibition will be held in the main exhibit of the Museum which will be transformed into a unique, stunning artistic ring that includes ten large photographs taken by Schatz, including the portrait of DeGuardia.